Let's just keep rolling with the 'healthy' foods, shall we? Adam loves tuna. Tuna sandwiches, tuna subs, tuna melts. So do I, but the combo of mayo and bread usually does it in for my calories. When I have this problem it can usually be solved by visiting the SkinnyTaste blog! She has so many light recipes that it is truly amazing. I didn't use her recipe but just her idea of making an open face sandwich that's 2 servings. Maybe I'm just a dumby for not thinking that up on my own though! This came up on pinterest and even though it may not be filling enough for Adam, it works for me. Paired with some veggies or chips or pretzels. 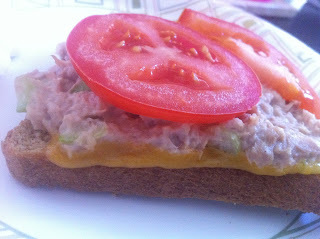 I get to have my tuna, bread and cheese without the guilt. Mix the first 5 ingredients together in a small bowl. Layer cheese, tuna mix and tomato on each piece of bread. Bake in your toaster oven until the cheese is melty. Delish! I love your blog. It inspired me to start mine!